FoodNewcastle! Have you seen our incredible food menu yet? In a city famed for incredible parties and nightlife, you’d be forgiven for (briefly!) overlooking Newcastle’s food scene. But in fact, there’s just as much going on in terms of restaurants and tasty fare as there are late nights and loud clubs. With plenty of places offering innovative eats, fine dining and hearty pub grub, plus a few hipster spots for craft beers and gourmet burgers… Well, we thought there was just one thing missing. Or ‘the flavours of Cuba’, if your Spanish ain’t quite up to scratch yet. You ready? Here’s a little taste of the dishes you can expect. Ready to taste our tapas? Tapas to delight every one of your senses. Whatever you like, however you like it, whenever, wherever. Tapas is one of the most versatile (and sociable!) ways to enjoy food, and for that – well, we just can’t get enough. From our perfectly formed and intensely flavoured Albondigas (that’s meatballs for any non-tapas-speakers out there) to our super tasty Jerk Fried Chicken, coated in a cajun spice and jerk crumb then served with rum mayo. The possibilities are endless! Fancy something veggie? Our Charred Halloumi is a HUGE favourite; chopped up with butternut squash and courgette and coated in a chilli jam glaze, it’s sweet and subtle – perfect if you’re a practising herbivore. Or if seafood is more your style? Our gorgeous Gambas Pil Pil is a Cuban classic; king prawns tossed in a buttery, chilli and garlic sauce. Or try our new Crispy Squid Tacos? Crunchy calamari with coriander and pickled chillies, served up to you in three soft corn tortillas. Too good to resist! All of these little dishes are BIG on flavour, and we promise you’ll be impressed. Maybe we’ll even be your new best tapas bar in Newcastle? You bet! Nothing says summer like the perfect tasty salad. There’s something magical about the perfect summer salad, right? Fresh and light, yet still seriously satisfying – the go-to choice when the weather’s gotten good and the heat’s turned up. With that in mind, we combined a few gorgeously seasonal ingredients and got a beautiful dish that’s straight from the heart of Cuba’s capital. Our Havana Crunch Salad combines spinach, coriander and peas with sour cream and hot rum sauce. 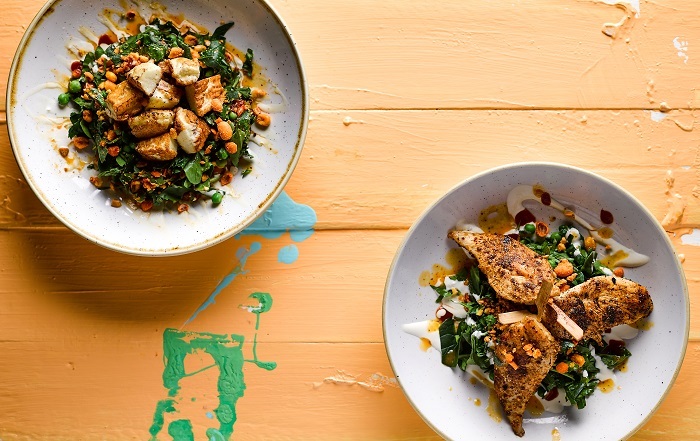 We then top it with crushed spicy mixed nuts for that all-important contrasting texture, and give you the choice to add smoky chicken or charred halloumi. 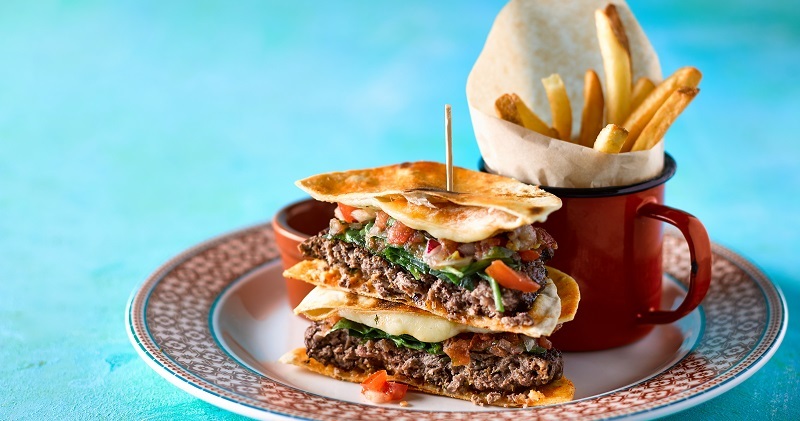 Our Quesadilla Burger combines classic Mexican and Stateside cuisine. Sure our flavours are mostly from Latin America, but we nipped up to the North for some inspiration for this one. For a signature sandwich with a twist, we’ve taken the classic American cheeseburger and topped it with mozzarella, hot chilli cheese, spinach, spiced sugar and salty serrano ham. We’ve squeezed all this goodness into one of our crisp tortillas… To make our very own Quesadilla Burger! You can get a burger anywhere these days – but nowhere does ’em like we do. And nowhere has combined the flavours of Mexico and the USA, quite like this… Ever before. If you’re not down for burger, sandwich or burrito but you’ve still got a pretty big appetite, our Large Plates are the perfect place to look. From classic Paella de Cuba to our warming Caribbean Chicken Curry, this varied selection offers something for every preference. Our Pork and Clams, for example. 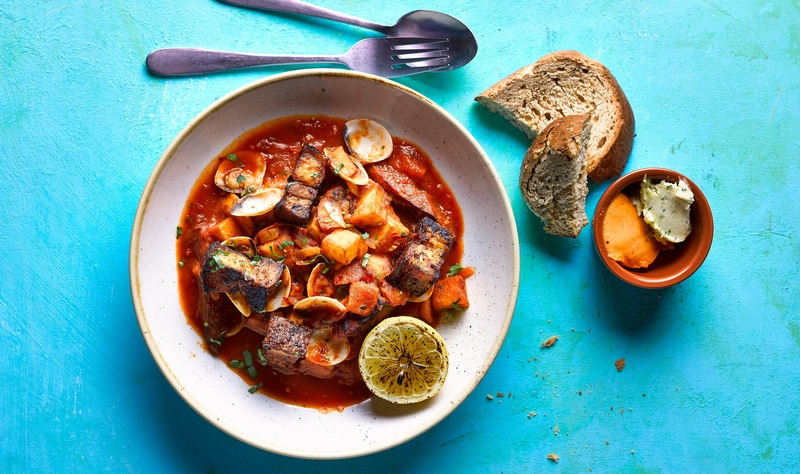 Crisp pork belly pieces, served on top of a tasty stew of chorizo sausage, clams and potato, all cooked in a spicy tomato sauce with white wine, garlic and onion. Or fancy something seriously hearty? Then get stuck into our huge Empanada Grande, a giant doughy handmade pie filled with Caribbean chicken, pineapple, spinach and cheese. We serve it up with green salad, chilli & lime dressing and top it with tasty sour cream. For the sweet-toothed foodies out there, we’ve got just the ticket. Try a slice of our totally indulgent, tropical-inspired Pineapple Cake; a light vanilla sponge with juicy caramelised pineapple topping, coconut buttercream and pumpkin seed crumb. We serve ours with rich coconut ice cream for even more creamy flavour. And if you like a classic? Our rich Chocolate Brownie ticks all the boxes, but with a brilliant Cuban twist. All thanks to a sumptuous drizzle of rum caramel sauce, we serve our brownie with vanilla pod ice cream, fresh strawberries and a sprinkle of basil sugar. And lastly, for a total stunner of a sweet that tastes as good as it looks – our decadent Chocolate Layer Cake. Made from light chocolate praline mousse, it’s simply too tempting – so sit back and take another bite. Newcastle, we’re nearly ready for you – and soon we’ll be bringing our unique and exotic Cuban fare to your already very tasty food scene. Want a cheeky flavour of what’s to come? 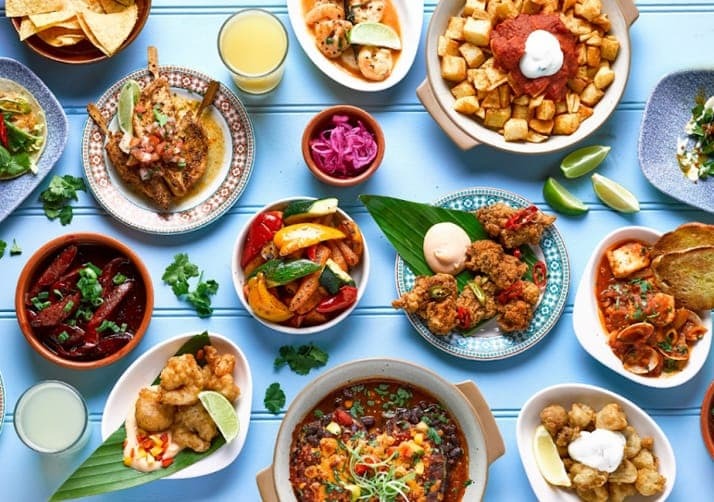 Check out our Revolución de Cuba Newcastle bar page for a true taste of the tropics – and just try and resist.